Dermod Flynn is an independent and feisty youth who earns a meagre living as an hired farm-hand in Donegal and Tyrone. He falls in love with the young and innocent Norah before losing contact with her when he moves to Scotland with a potato-picking squad. Not content with his lot, Dermod reads voraciously and discovers his talent as a writer. He is lured to London’s Fleet Street where he briefly follows a career in journalism before reuniting with his lost love. 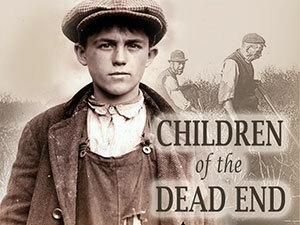 This gritty and poignant account of the hardships endured by the poor in early 20th century Ireland and Scotland is based on Patrick McGill’s semi-autobiographical novel. It’s moving story, peopled with extraordinary characters is told with humour, music and song.